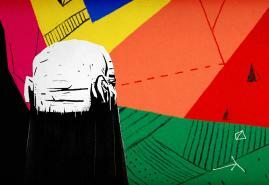 Next edition of VOID International Animation Film Festival begins next week. Three Polish animations were invited to the programme. The festival has been taking place in Copenhagen for four years now and it continues to be a real treat for the fans of animation. Apart from animated short films, it also shows feature productions and music videos. Short films compete for awards, but the sections outside of the competition, where one can find programmes devoted to films from film schools or selected countries, will be no less interesting. In this year's programme of VOID International Animation Film Festival one cannot miss a popular and previously awarded film "Another Day of Life" directed by Damian Nenov and Raúl de la Fuente. What is more, two Polish animations were invited to the short film competition: "Room" by Michał Socha and "Incarnation" by Barbara Rupik.